A few weeks ago I’ve posted a beginner tutorial on how to start working with Symfony2 EasyAdminBundle admin panel which has been rewritten twice because of the newly introduced functionalities. Today I want to show you more: some advanced customization and integration with FOSUserBundle and VichUploaderBundle (and maybe more soon) which are often used. You can view the changes in this commit. Another really nice feature are flip switches. Flip switches allow users to flip state of boolean properties. For example if we have User entity with boolean property: enabled or locked, we can change its value and disable User from the list view. This is done by calling proper AJAX action by EasyAdminBundle. No extra code is necessary to handle those actions. What is also worth noting we can modify it from standard edit form view with checkbox widget. Usually default theme is not enough, we and our clients need some changes that we need to introduce to admin panel. 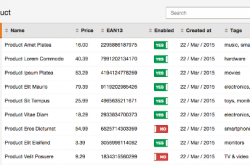 EasyAdminBundle starting from version 1.4 offers nice and developer friendly customization possibilities. How to add Logout button? In this case if we want to modify template that is used by all EasyAdminBundle views we should override layout file: layout.html.twig. To do that we should create new easy_admin folder in app/Resources/views directory and copy / paste default EasyAdminBundle layout to be able to modify and extend it. Notice: In this example we have used FOSUserBundle route: fos_user_security_logout as we have integrated it earlier with our EasyAdminBundle. After those changes were introduced we need to reset Symfony2 cache and refresh the page to view the changes (logout link is shown on images below). Notice: If you are new to Symfony2 commands shortcuts and aliases, I encourage you to read this blog entry: Using Symfony2 console the right way. we are not limited only to override templates – starting form EasyAdminBundle version 1.5, we can override any action executed during the backend workflow. This is one of the most common integration as we always need some authentication and users to login to EasyAdminBundle application. Installation has been described in previous entry. Those properties are needed to complete integration process with FOSUserBundle: we need information about creation date and date of update. 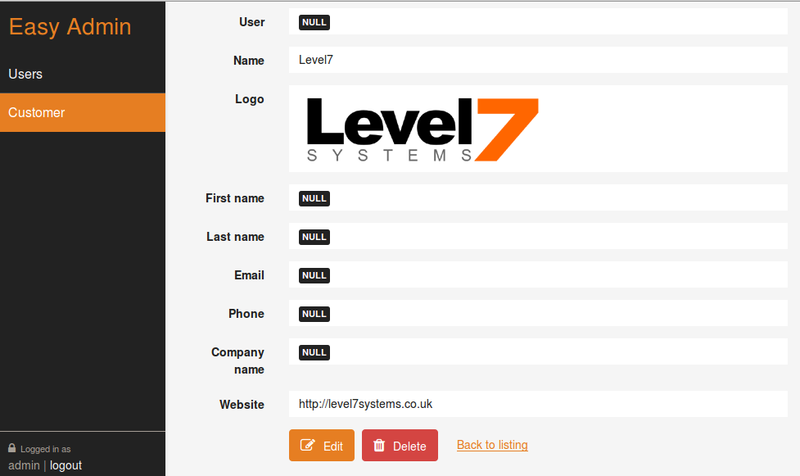 In the previous entry I have described how to configure basic users list and add / edit form. To biggest problem with this integration is creating and updating users and saving / updating their passwords. Latest version of FOSUserBundle provides UserListener which is updating canonical fields and password field on prePersist and preUpdate events. The thing is that we need to remember that configuring new or edit user forms we must embed plainPassword attribute instead of password. This will cause setting and updating password property by UserListener and its prePersist and preUpdate events listeners. To display password field in User add / edit form we need to configure it in app/config/admin.yml file in form section – we can configure instead new and edit sections to provide different configuration for each form type. Notice: if we want to update for example only password attribute during one User update, we need to implement special hook as plainPassword field is not User mapped property and updating it will not trigger UserListener to update password field. Now all we have to do is to update updatedAt property each time plainPassword property will be set. That’s it. We can now set or update User password from EasyAdminBundle panel. Notice: We can also implement Doctrine timestamable behavior which will set updatedAt and createdAt properties each time we change / create User entity. The VichUploaderBundle is a Symfony2 bundle that attempts to ease file uploads that are attached to ORM entities, MongoDB ODM documents, PHPCR ODM documents or Propel models. 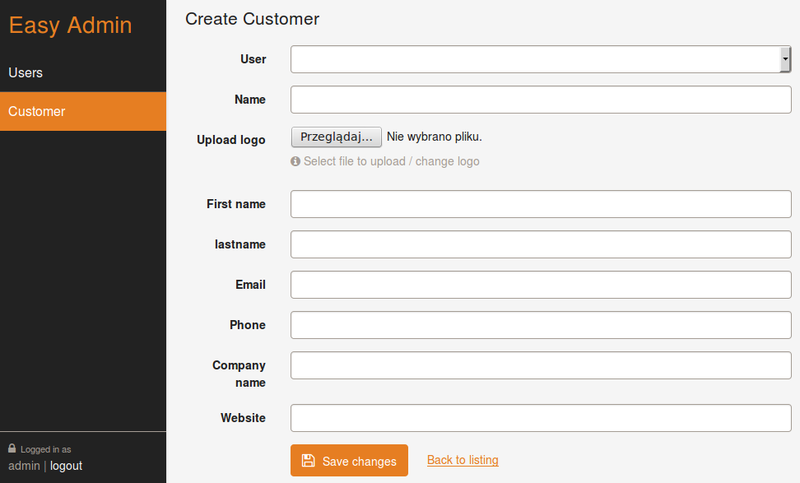 In this example I’m going to add support for uploading customer logo image in EasyAdminBundle panel. Before we start we need to install VichUploaderBundle bundle and setup necessary configuration. To install VichUploaderBundle follow the steps from documentation. After that we need to configure VichUploader to work with our Customer entity but first we should add logo property to Customer entity. Our entity has now logo property and we can setup logo uploading process. First we are going to set mappings in app/config/config.yml file. Those mappings are later used for uploading Customer logo to proper location. And that’s all. Now we will use EasyAdminBundle syntax to add logoFile field to Customer form and after submit, the uploaded file will automatically be moved to the location we configured in app/config/config.yml and the logo property will be set to the filename of the uploaded file. Note: I do not recommend uploading files / images the way it’s described in the official Symfony2 documentation. Just try both methods and make a choice. Note: Another nice option is help attribute that we cen set for each form field. Help property is message displayed below the form field in the edit, new and show views. As always source code used in this examples can be downloaded / cloned from our Level7 GitHub repository. Let me know if you have any problems with other EasyAdminBundle integrations – I will try to solve it and describe here. Good luck with your integrations! This guide is simply awesome, and fits to latest EasyAdmin versions, great job ! Really nice and easy. But what about embedded forms? This example is good, Vich and EasyAdminBundle make a great couple for quick administration that used files (images). What I do not get working currently is one entity with a collection of images. Vich-Uploader has a great example of how this can be done (with Doctrine and SonataAdmin). It uses a child entity for the images (BikeImage with a manyToOne relation with Bike) but I don’t know if this structure is possible in the EasyAdminBundle… Anyone an idea? How to avoid redirection to list after form submission? We follow the VichUploaderBundle sample but update is not working. Any ideas ? Could you please give me more details? What is not working? File is not being uploaded? i’m relative new to Symfony, and i found this great tutorial … The example works … but the file is not beeing uploaded phisically, and the logo attibute in the database is not updated/inserted, can you help me please?? Thank you. Could you please give me more details? Some code? Github link? i used sonata admin bundle,but i use easy admin bundle now! Thank you, really useful article. In particular, integration with VichUploaderBundle. Thanks ! This is a great tutorial. But i have a problem with the file uploading. In fact, the folder and database cell are empty. I searched but i don’t find the solution.